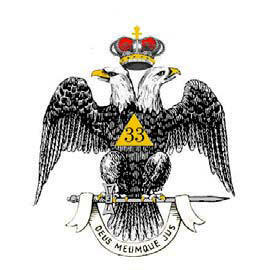 The Deputy for the State of Wisconsin selects, and the Supreme Council of the Northern Masonic Jurisdiction confers the 33° only on a limited number of 32° Scottish Rite Masons who have performed outstanding service within Scottish Rite or the Masonic fraternity, or who have given exceptional service in some other field of endeavor. These men wear the White Cap which distinguishes them as Sovereign Grand Inspectors-General, 33° and Honorary Members of the Supreme Council. In the Valley of Green Bay, portraits of those who have been coroneted as 33° Masons hang on the wall in the main lobby of the NEW Masonic Center. Each year, our Valley’s four Top officers recommend the honor of the Meritorious Service Award by Wisconsin’s Council of Deliberation, in recognition of a 32° Mason’s distinguished service in Scottish Rite Masonry. These men are honored with the Red Cap in token of that recognition, and their likeness is prominently displayed on the wall in the dining room between the library and the office of the Secretary of the Valley of Green Bay on the lower level of the NEW Masonic Center. The Director of Work honors those who perform and otherwise stage our degrees…the casts and crews…with selection into the Valley of Green Bay’s “Hall Of Fame.” These names are engraved for all to see as they enter the Gettleman Auditorium in the Northeast Wisconsin Masonic Center.